This topic describes how to install and configure the Toolkit for Visual Studio. Have an AWS account. This account enables you to use AWS services. To get an AWS account, on the AWS home page, choose Create an AWS Account. Run a supported operating system: Windows 10, Windows 8, or Windows 7. We recommend that you install the latest service packs and updates for the Windows version you're using. Visual Studio 2013 or later (including Community editions). We recommend that you install the latest service packs and updates. The Toolkit for Visual Studio is still available if you're using Visual Studio versions 2008, 2010, and 2012 (including Express editions where available). However, it is not supported. For Express editions, the installation includes only the AWS project templates and the standalone deployment tool. Visual Studio Express editions don't support third-party extensions, such as AWS Explorer. Find links to these older versions of the Toolkit for Visual Studio below in Older Versions of the Toolkit for Visual Studio. The Toolkit for Visual Studio for Visual Studio 2017 and Visual Studio 2019 is distributed in the Visual Studio Marketplace. You can also install and update the toolkit using the Extensions and Updates dialog within Visual Studio. The Toolkit for Visual Studio 2013 and 2015 versions are part of the AWS Tools for Windows. You can install the AWS Tools for Windows for these versions as follows. Navigate to the page AWS Toolkit for Visual Studio. In the Download section, choose Toolkit for Visual Studio 2013-2015 to download the installer. To start the installation, run the downloaded installer and follow the instructions. By default, the Toolkit for Visual Studio is installed in the Program Files directory, which requires administrator privileges. To install the Toolkit for Visual Studio as a non-administrator, specify a different installation directory. 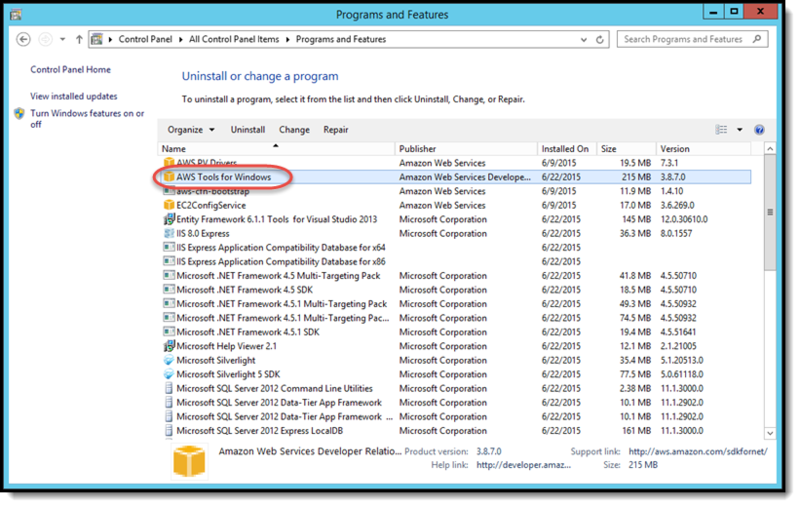 To uninstall the Toolkit for Visual Studio, you must uninstall the AWS Tools for Windows. To open Programs and Features directly, run appwiz.cpl from a command prompt or the Windows Run dialog. Choose AWS Tools for Windows, and then choose Uninstall. Uninstalling the AWS Tools for Windows doesn't remove the Samples directory. This directory is preserved in case you have modified the samples. You have to manually remove this directory. Visual Studio 2008—Install the Toolkit for Visual Studio 2008 from https://sdk-for-net.amazonwebservices.com/latest/AWSToolkitForVisualStudio2008.msi. Visual Studio 2010 and 2012—Install the Toolkit for Visual Studio for Visual Studio 2010 and 2012 from https://sdk-for-net.amazonwebservices.com/latest/AWSToolkitForVisualStudio2010-2012.msi.